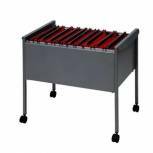 Rotadex Standard Universal Filing Trolley With Locking Lid Grey RT501S Pack of 1 Rotadex universal filing trolley provides convenient and compact storage for frequently accessed A4 or F/C suspension files. Easily manoeuvrable and robust. Shelf and lockable lid. Manufactured from sheet steel. Dimensions W650 x D450 x H700mm. 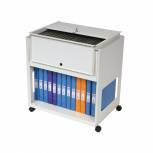 Durable Filing Trolley Foolscap Grey 3097-10 Pack of 1 Quality foolscap suspension mobile filing trolley suitable for 80 suspension files. Constructed from high grade epoxy coated steel with four castors. Dimensions - H592mm x W665mm x D425mm.